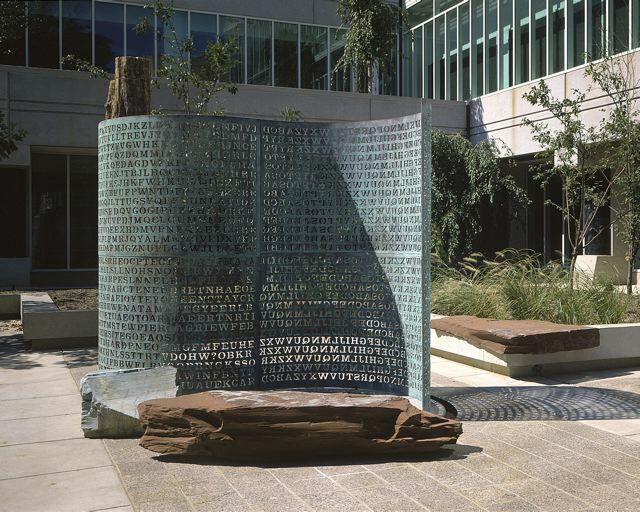 A soon as the sculpture was revealed, codebreakers both at the CIA and in the general public went to work on the puzzle. In 1999, a computer scientist named Jim Gillogly announced that he had solved most of the puzzle. There were four distinct parts to the code, and he had managed to solve the first three. The fourth section of the code remained unsolved, and to date, no one has brought forth a credible solution for part 4. 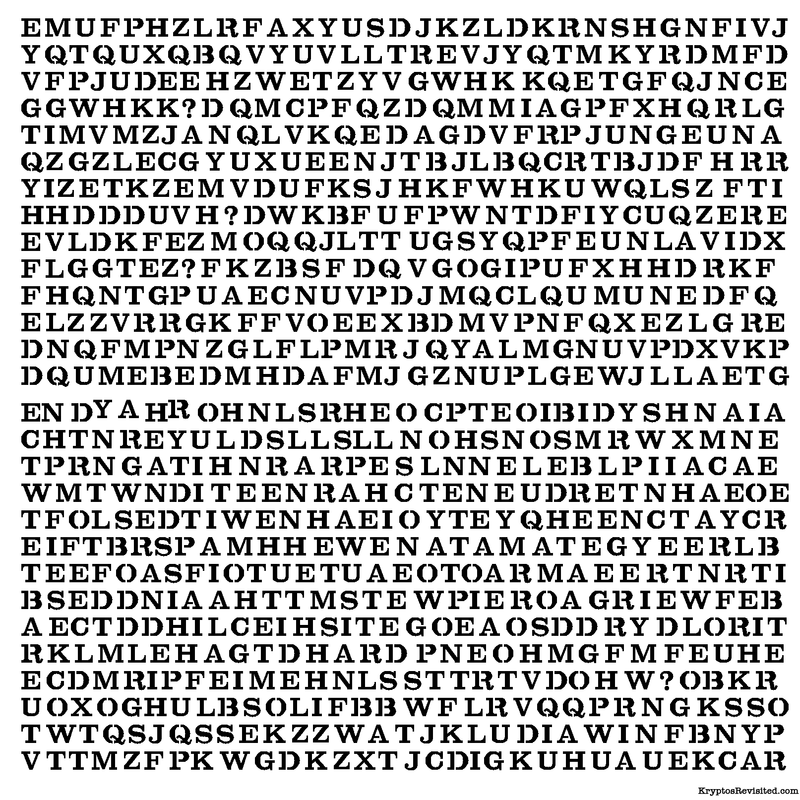 Note: This section contains spoilers regarding the first three sections of the Kryptos code. If you want to try to solve these yourself, do not read this section. These are provided here to help set the context for the fourth (unsolved) section of the code. It was encrypted using a Vigenere cipher, with a key of PALIMPSEST and the modified alphabet depicted on the second tableau. The first letter is E, and the first letter of the key (PALIMPSEST) is P. So we find P in the leftmost column, move right until we hit E, and then move up to the top, ending at B. This makes the first letter of our plaintext a B. For the next letter, we find A in the leftmost column, and follow it to the right until we hit M, then up, ending at E.
Seventy seven degrees eight minutes forty four seconds west. Some years after this was originally solved, the sculptor Sanborn made it known that there was an error in the ciphertext, where a single character had been omitted (right after the word "west" on the second-last line). He assumed that it would be obvious to a solver, because it would cause the remaining text to decipher into gibberish, but by what seems to be coincidence, the text actually deciphered into the phrase "ID by rows." It has since been determined (and confirmed) that the correct decryption ends with XLAYERTWO instead of IDBYROWS. This turns out to be a very different kind of encryption. It uses a transposition cipher which doesn't actually change any of the letters, but simply rearranges them. The task is to find the method used for the rearrangement. Slowly, desparat[e]ly slowly, the remains of the passage debris that encumbered the lower part of the doorway was removed. With trembling hands, I made a tiny breach in the upper-left-hand corner, and then, widening the hole a little, I inserted the candle and peered in. The hot air escaping from the chamber caused the flame to flicker, but presently details of the room within emerged from the mist. "Can you see anything?" Q ? 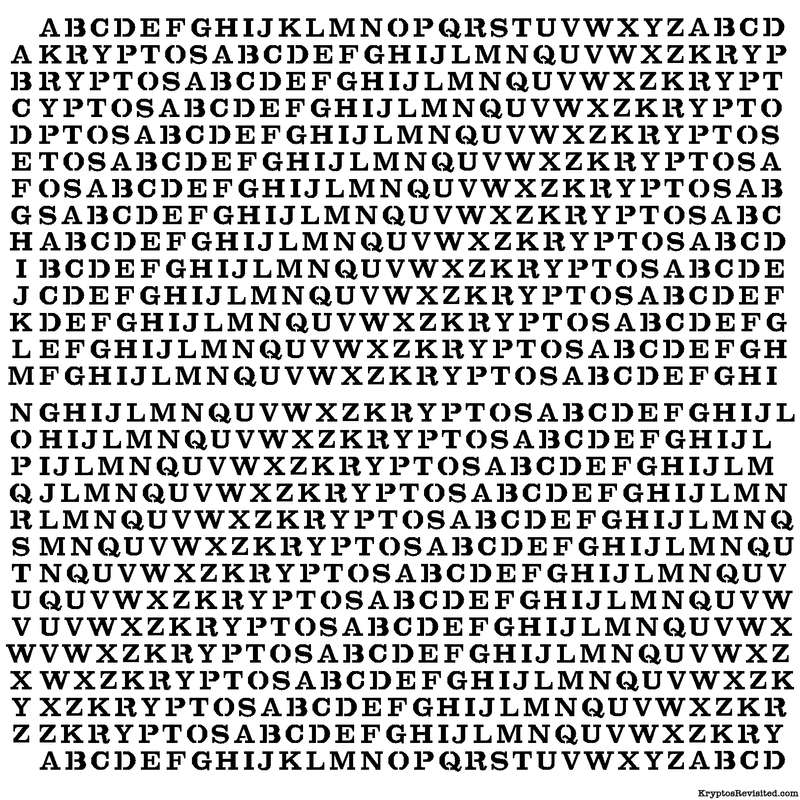 Most Kryptos fans assume that decrypting it will involve some combination of the methods used for the first three sections. To date, no one has been able to solve it. There is a plethora of information about Kryptos on the web. A great place to start if you want more information is Elonka Dunin's Kryptos Page (especially the FAQ). Like all of my Unsolved Mysteries puzzles, I will give a 500 rep bounty to anyone who manages to find a credible solution. Alconja and question_asker have both agreed to match this bounty, so the total bounty is 1500 reputation. This is not a solution, only a potential step along the way recently proposed on the Yahoo group by void solid and extended by dankuda. I'm reposting it here in hopes that someone can take it another step forward. There are exactly the same number of letters of each frequency in each string! This looks to me like more than mere chance, but I'm not enough of a cryptographer to know where to go from here. Of note, it's been officially stated that NYPVTTMZFPK (the last 11 characters of the 5th string) will decode to BERLINCLOCK. The letter frequencies clearly doesn't match here, but since they produce same-length strings, it makes sense as a clue to apply the same logic to K4 (as I did above). Not the answer you're looking for? Browse other questions tagged cipher real unsolved-mysteries or ask your own question.